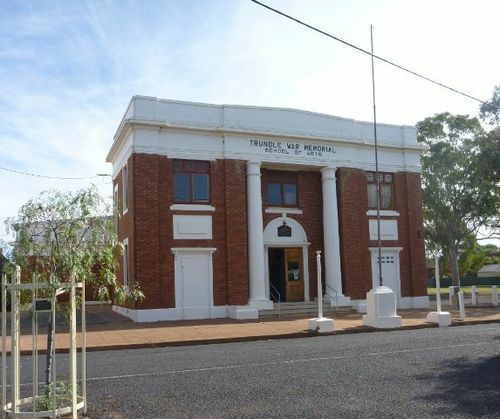 The Trundle War Memorial School of Arts was erected to commemate those who served in World War One. In 1924 Mr. E. L. Jones donated block of land in Forbes Street, F.H. Sect. 8, Part 10-11, with an 80ft. frontage. At a meeting held on 15th November, 1924, H. Cameron moved, J. Henson seconded a motion which was carried, reading as follows: "That a War Memorial School of Arts and Hall be built on the new site". The title was changed in May 1925 to Trundle War Memorial School of Arts. The Foundation Stone of the new Hall was laid by Major General Sir Charles Rosenthal, K.C.D., C.M.G., D.S.O.V.D., on 4th June 1926. The building was completed in February, 1927, and officially opened in the afternoon on 15th March, 1927, by Mr. E. L. Jones. The Soldiers' Room, which had been incorporated in the original plans, was opened at a Dinner Rally on the 23rd March 1927.